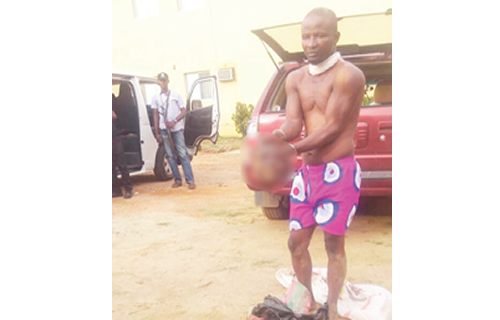 Police authorities in Osogbo, Osun State capital yesterday arrested a 38-year-old man, identified as Ajibade Rasheed, with a fresh decapitated head of an old woman, including her private part, liver and intestine. Other parts of the body found on the man include two palms, lungs and blood kept in a bottle.Parading the man with the strange discoveries, at the police headquarters, the Commissioner of Police, Mr. Fimihan Adeoye, said policemen on surveillance arrested the suspect at Oluode market, in Osogbo. Adeoye said the police would get to the root of the dastardly act, adding that an accomplice to the suspect, who was in the vehicle in which the human head was found escaped and was being trailed by his men. Rasheed, a native of Ikirun, said “I am an Alfa and herbalist.